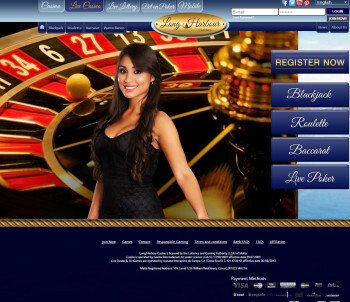 Long Harbour Casino announced on the 1st July 2015 that they were no longer accepting registrations from new players. If you’re after a Global Gaming Labs live casino then I can recommend the very good Pinnacle Casino. Long Harbour live Casino is the first casino that I’ve reviewed on Live Casino Comparer that uses the Global Gaming Labs live Casino software. They are based in Malta but the live Casino studios are located in Costa Rica, although you wouldn’t know they were in different places as the live casino has been integrated into the casino very well. Long Harbour use B3W software for all their other games and they can be played in a non download form on a PC or a mobile device. The Long Harbour Live Casino is only available on PC, it’s not their fault as GGL haven’t launched a Mobile Live Casino yet, but if you’re interested in playing on a mobile device checkout my mobile live casino recommendations. When you first reach the site you’ll need to create an account to be able to access the 5 live casino games, Live Blackjack, Live Blackjack Unlimited, Live Baccarat, Live European Roulette and Live Casino Holdem. The sign up process is easy and will only take a minute to complete. You will need to make a deposit to be able to see the games in action. The minimum you can deposit is £10. You’ll find that the minimum stake for most games is £5, so £10 will buy you a couple of hands or spins of the roulette wheel. The games lobby is the first place you’ll land and as the name suggests it’s where you choose what games to play. Blackjack – This is a standard 7 Seat game that is played with 8 decks. You can only play one seat position. European No hole card is used by the dealer, but the good news is that you can double on any hand value and even splits. You can only split a pair once and split Aces receive only one card. The dealer stands on all 17’s. One of the unique selling points of this blackjack is the ability to surrender your hand when its your turn to bet. You’ll get back half your stake. If you want to know when to surrender then read this blackjack strategy guide for hints and tips. Disappointingly there are no side bets available, which is a shame as the Blackjack is otherwise really good. For those that like a quick game the bet time is 15 Seconds. Blackjack Unlimited – This is a 5 hand table. This version of Blackjack allows an unlimited number of people to play each hand as if it was their own. The outcome of each hand for you is decided by the actions you take when playing the hand. As an individual player you can play up to 5 hands at the same time. The only difference you’ll find when playing this from the 7 seat version is that when a pair is dealt you will be given only two options. One to split the pair and play each hand, or to surrender your hand and receive 80% of your stake back. A bit pants if you ask me and one of the limitations of this type of game. The rest of the rules are the same as those described for the 7 Seat game above. Baccarat – The traditional Player – Banker (Punto Banco) game you’ve come to love or hate! 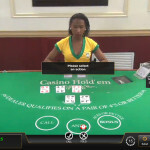 8 decks are used in this game and three side bets can be played. Player Pair, Banker Pair or Any Pair. As for normal betting you can bet on Player, Banker or for a Tie at 8-1. A full set of Road Maps are available so you can track the hands from the current shoe. The road maps are are cleared when the shoe is replaced. 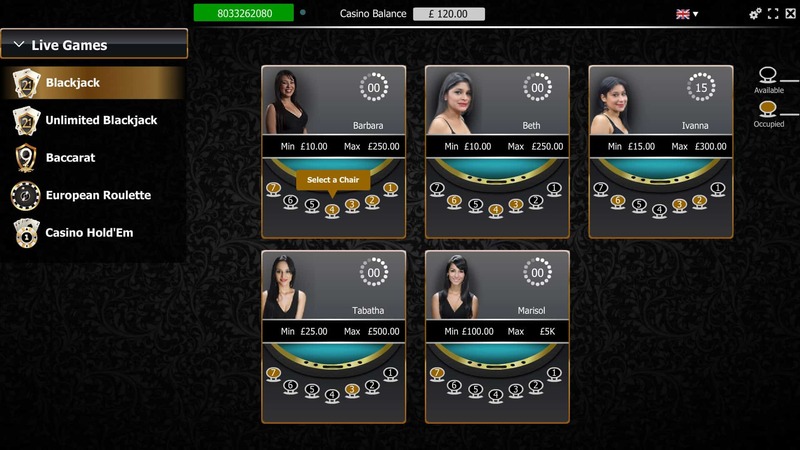 European Roulette – This is standard single zero roulette. French and special bets can be made and the racetrack is very clear which makes making French bets easy. The display of the table is very simple, and you get two camera views, with the second showing a close up of the ball and wheel during the spin and the final result. 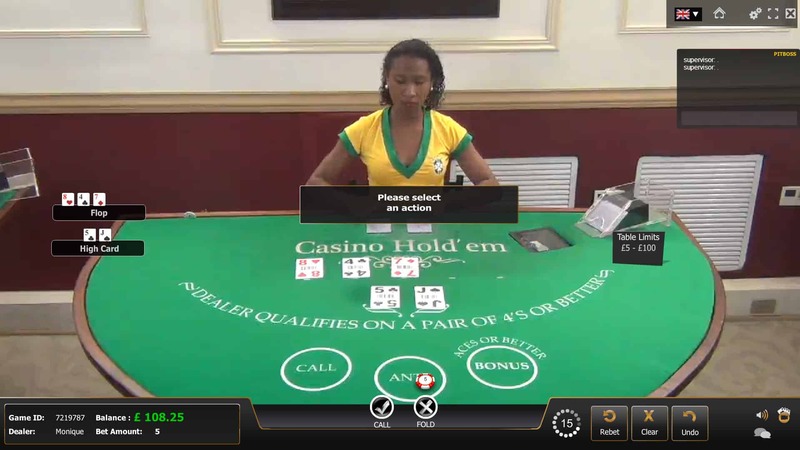 Casino Holdem – This is played with one deck that gets manually shuffled by the dealer after each hand. A bonus bet can be placed when you place the Ante bet. Only one hand is dealt, so multiple players can play at the same table. Betting time is 25 seconds. I have to say I’m a fan of the software interface and the general experience at Long Harbour live casino. The dealers all speak good English and generally seem to be enjoying themselves. I’ve played at one or two tables where chat has been that active and the dealers certainly seem to be a bit bored. I tried playing Blackjack unlimited where it was like that and left pretty quickly as it does affect the mood. The viewing in full screen is very good and I have to play in this mode as the smaller screen mode is just too small for me to see cards clearly. Chat is enabled but you can’t see what other people are saying so it’s a bit difficult to follow conversations and join in. I think this is a bit short sighted of live casinos, but then I can understand them not wanting players from others casinos talking to players from their casino. Crazy really, but there you have it! You can see your betting history under the settings tab at the top of the screen along with detailed information on the rules of the game. You can’t see hand history’s though when playing blackjack, just your own in betting history. There is a good range of banking options to choose from, a detailed list appears above. Minimum deposits are £10, but there are deposit limits in place. £800.00 a day, up to £2,600.00 a week and up to £7,500.00 each month. Withdrawals are processed within 5 days. Before you make your first withdrawal you will need to submit your documents for verification. This doesn’t take too long to process, so it’s worth doing shortly after you sign up. details of how to do this are in the withdrawal section of the site. Long Harbour are licensed in Malta and all of their games are independently tested by Itech Labs. All banking activity on the site is performed over SSL encryption. There are no bonuses for live casino games, although you do get 30 free Slot spins on 3 slot games when you make your first deposit. I have to say that I really like the Long Harbour Live Casino. They have taken the generic solution from Global Gaming Labs and this works well for them. I always prefer playing full screen so the default software mode suits me. I’m a bit disappointed that there are no side bets on Blackjack, but the option to surrender your hand for half your stake is compelling when facing a possible loosing hand. I’d certainly recommend giving the casino a try.